Family friendly pro wrestling returns to the Hickory Metro Convention Center for a live TV taping. 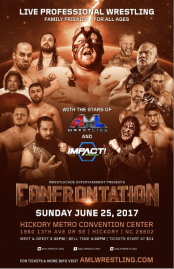 HICKORY, N.C. - June 2, 2017 - PRLog -- The Stars of IMPACT Wrestling and the Stars of AML Wrestling are coming to the Hickory Metro Convention Center in Hickory, NC on Sunday, June 25 for CONFRONTATION! Don't miss your chance to experience the Stars of IMPACT Wrestling and the Stars of AML Wrestling when they come to your area! The Stars of IMPACT Wrestling can be seen on Pop TV Thursdays at 8 p.m. ET/7 p.m. CT. The Stars of AML Wrestling can be seen on My48 Saturdays at 12 p.m. ET when their new season starts July 1, 2017. Former 2x World Heavyweight Champion EC3 leads the list of IMPACT Wrestling Stars headed for a CONFRONTATION along with former World Heavyweight Champion Abyss, former 2x X Division Champion DJZ, former 2x X Division Champion Suicide, former World Tag Team Champion Mayweather (fka Crimson), former NWA World Heavyweight Champion Wilcox (fka Jax Dane), former TNA King of the Mountain Champion Eli Drake and others. Current AML Wrestling Champion Zane Dawson leads the list of AML Wrestling Stars headed for a CONFRONTATION along with former AML Wrestling Tag Team Champions The Heatseekers, current AML Wrestling Prestige Champion Brandon Scott, former AML Wrestling Prestige Champion Axton Ray, Caleb Konley and others. Also appearing at this event are Special Guest Stars: former 6x World Heavyweight Champion Vader, former World Heavyweight Champion & WWE Hall of Famer Ron Simmons and former ECW World Television Champion/WWE Superstar Super Crazy in a rare East Coast appearance. Tickets are on sale NOW at Frank Myers Auto Maxx in Winston-Salem, NC, online at http://amlwrestling.com/get-tickets/, charge by phone at 336-831-0646 or buy tickets at the door the day of the event while they last. Tickets start at $15 and fans who purchase a Super Ticket will receive a commemorative poster and an early-entry autograph session with all IMPACT Wrestling Stars and all AML Wrestling Stars at 2:30 p.m., redeemable with the ticket the day of the show.